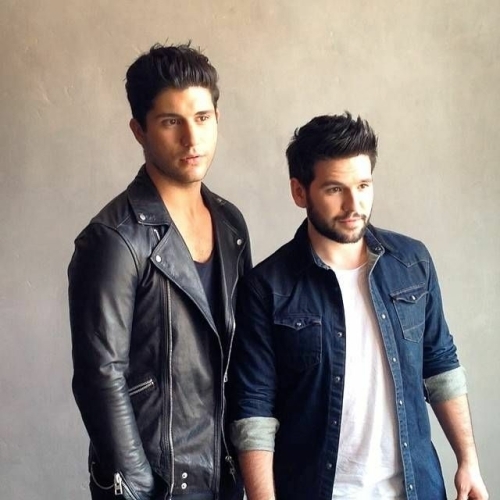 Dan + Shay is an American country music duo composed of Dan Smyers and Shay Mooney. The duo is signed to Warner Bros. Records Nashville and has released its debut single "19 You + Me", which has charted on Country Airplay and Hot Country Songs. Before the duo's foundation, Mooney was a solo artist on T-Pain's Nappy Boy Entertainment label, and Smyers was a member of a group called Bonaventure as well as a previous member of the band Transition on Floodgate Records label. The duo performed on The Ellen Show performing 19 You + Me in 2014. The duo made their Grand Ole Opry debut February 1, 2014. They also received a 2014 Academy of Country Music Awards Vocal Duo of the Year nomination. Dan + Shay was the opening act for Hunter Hayes on his We're Not Invisible Tour, which began in March 2014. Dan + Shay will open up for Blake Shelton on the 2014 leg of his Ten Times Crazier Tour. The tour will begin in June 2014.